As seen on The Today Show, Rachael Ray, and Kelly and Michael. From the Emmy-Award winning host of Survivor, Jeff Probst, with Middle School: The Worst Years of My Life co-author, Chris Tebbetts, comes a brand new family adventure series! A family vacation becomes a game of survival! It was supposed to be a vacation--and a chance to get to know each other better. 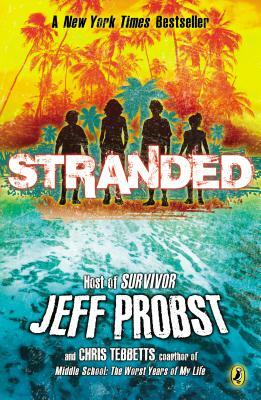 But when a massive storm sets in without warning, four kids are shipwrecked alone on a rocky jungle island in the middle of the South Pacific. No adults. No instructions. Nobody to rely on but themselves. Can they make it home alive? A week ago, the biggest challenge Vanessa, Buzz, Carter, and Jane had was learning to live as a new blended family. Now the four siblings must find a way to work as a team if they're going to make it off the island. They're all in this adventure together--but first they've got to learn to survive one another. Chris Tebbetts is the New York Times bestselling co-author of James Patterson's Middle School series. Originally from Yellow Spring, Ohio, Tebbetts is a graduate of Northwester University. He lives and writes in Vermont.